Developing a cutting edge medical device can be really fun and exciting.There’s always something to test and do and learn from. You have that great feeling you’re changing the world. However, documenting the development of a medical device isn’t nearly as fun. 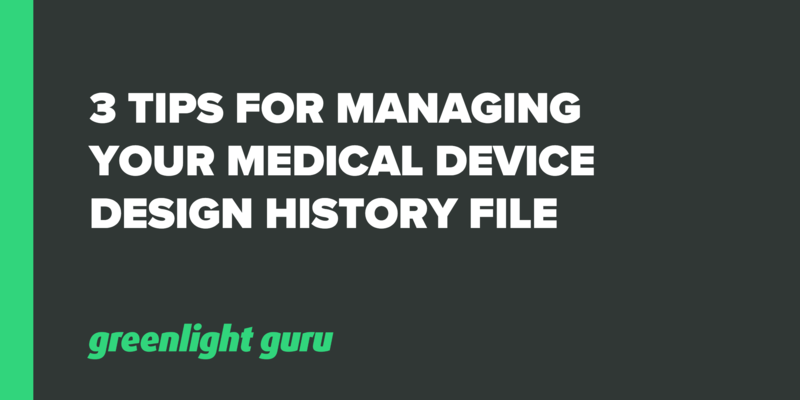 Still, the complete documentation, known as a Design History File (DHF) is one of the most important set of documents you will create during the life of your medical device company. Essentially, it’s the proof you need to give the FDA that you followed all of the design control regulations. And once you have received market clearance, the FDA can audit you at any time--so this proof is absolutely necessary. Essentially, the DHF is the central hub for all the things medical device regulators care about. This is the place where you show all the linkages and relationships between the Design Controls. It’s where you demonstrate traceability of all your Design Controls throughout the entire development process. The burden of proof will always be on you, and you want to be able to show you’ve done everything correctly. At the beginning of development, the DHF can be simple. You can start with paper files, but I recommend you go digital as soon as possible. Moving to an electronic document control & management solution built with FDA Part 11 compliance in mind will save you from the documentation nightmare I all too often see happen with new medical device projects. Considering how important these documents are, you would think it would be easy to make sure they’re always being managed properly. Sadly, that’s not the case, but I have a few tips I’ve picked up over the years for making it easier. I’m going to tell you this, and you’re going to think it isn’t that important. Trust me, it is. Start your traceability matrix early, and keep up with it throughout the entire process. After you launch, the FDA can audit you any time. When that happens, you don’t want to waste valuable time getting it ready. This may seem so minor it’s not worth mentioning. But, maintaining a completely separate document for your Design History File is important because otherwise it will get messy with all the other notes and things that go into product development. Again, remember, you want this to be clean and ready to present whenever you’re asked for it. In order to keep this as thorough as possible, make sure the whole team has access to it. Everyone who contributes to the project should be able to make notes and update the DHF. If you’re just starting out on the journey, you might be thinking I’m making a big deal out of the Design History File. But, you’ll soon realize that I actually can’t overstate its importance. You see where I’m going with this. If you keep up with the DHF, you won’t ever regret it.